What Makes the Movies Talk? Electrical Expert and Radio Engineer Millions of people have heard and seen the new talking movies, but the theater-going public knows little about the machinery that makes this form of entertainment possible. In this article Mr. Crosby writes authoritatively of the development of the talking movies, being an electrical engineer who has made a study of the sound devices. SPEECH reproduction as an accompaniment of motion pictures has been perfected to such a degree that the common variety of silent movie promises to become something of a rarity. Even the 100-seat side-street theater will soon be able to cast out its old mechanical organ and give its patrons the same high quality musical accompaniment that distinguishes the presentations in the largest movie palaces. There are several different systems coming into wide use and many motion picture theatres throughout the country are being equipped with such apparatus as quickly as possible. Within a year nearly all of the major pictures and many of the minor ones will be available with means of reproducing either musical accompaniment or the voices of the actors. The talking movie systems are all closely allied and the differences in quality seem to be largely matters of personal opinion. There are three major systems of movie voice reproduction. Briefly, these are: the film on which the music or voice is photographed directly; the use of a record which is operated in synchronism with the motor of the projection machine; and the third system which is not operated in synchronism but is manually operated by a trained expert. The first system is probably the most interesting of them all, for it is here that sound waves are turned into light and then back to sound waves after passing through apparatus as electrical waves. The entire success of this system depends upon a little device known as the photoelectric cell, a device not much larger than the vacuum tubes used in most radio sets. This photoelectric cell is sensitive to light rather than to pulsations of electricity. The tube itself is entirely enclosed in an opaque covering except for a small window through which a beam of light is directed. When there is no light the cell has the property of conducting full electrical impulses, but as the light gains in intensity the current drops off accordingly until, at full brilliance, there is no flow at all. Its response to each graduation of light is instantaneous. Suppose that the camera is set up and we are ready to take a picture by this method. If recordings of the actors’ voices are to be made, it will be necessary to set up supersensitive microphones about the studio, arranged in such a way that we can cut in or off instantly any group of “mikes.” If the musical accompaniment only is to be made, this work will not be done until after the picture is finished and ready to show, when the usual score will be made and the music run off at a showing of the picture. The sound is picked up by the microphone and is amplified in a device which is almost exactly like the ones used for radio purposes, except that it is larger and incorporates much finer apparatus than is usually found in such devices. These instruments represent just about the highest degree of manufacturing skill. If there are several microphones to be used, each will have an amplifier and a control by means of which the operators can handle the situation from outside the “set.” All of these amplifiers then feed into a “mixer” panel where there is usually another amplifier and the resultant of this device is then brought to a device which operates something like the mechanism of an ordinary dynamic loud speaker, except x a Light Turned Into Sound A ray of light reflected from this polished surface is photographed on the film along with the action of the picture. The entire musical or audible part of the film is concentrated into a strip on the edge of the film, this strip being only one-eighth of an inch wide. It is called the sound track and when the film is developed and the prints made, each one will have the music or voice printed along with it as a part of the film itself. The sound track will appear like a lot of fine horizontal lines ranging from light to dark according to the accompaniment. In the projection machine, used to throw the picture on the screen, a strong arc light passes through the film itself and thus projects the picture as desired. The sound track is screened off from this light and another and smaller light, called the exciting lamp, casts its beam through a carefully regulated lens and thence to the sound track. It passes through here in quantities in exact accord with the number of horizontal lines, to the photoelectric cell where the light ray is again converted back to electrical impulses which are exactly like those that came from the microphone and in accordance with the theory of the photoelectric cell as already explained. This part of the equipment might be likened to the detector in the radio receiving set. This simple fluctuating electrical current will change with each change in light and shade in the film and it is a simple matter to feed the electrical output of the photoelectric cell into a line amplifier where it is eventually sent out on a wire that runs back stage to a series of especially designed loud speakers, far larger than anything used for home radio entertainment, yet almost exactly the same in shape. The output of the amplifier may be sent through several of these speakers at the same time, giving the effect of great depth of tone. The speakers are placed in back of the screen, which is opaque enough to permit the picture to be fully visible yet has the property of permitting the sound waves to pass throughly freely, thus giving the effect of sound actually emanating from the lips of the shadow figures on the screen. Speed Must Be Regulated Ordinarily, film is exposed through the camera at a somewhat slower speed than the rate used in projection but, obviously, with this system it is necessary that, the film should be run at equal speeds on both occasions. Speeding it up in projection will cause distortion in both voice and music. The same thing applies to an ordinary phonograph where, if it is speeded up too far beyond the normal speed of 80 revolutions per minute the music will become shrill and high pitched, entirely unlike the original reproduction. Another popular method of securing somewhat the same results makes use of an especially made record which operates along lines somewhat similar to those of the ordinary household phonograph. Here, too, microphones and amplifiers are used, but the sound is impressed upon a master record from which other records may be made as needed. Ordinarily, the reproduction of sound from the record thus made, would take place with the tone arm and horn, but this would be impractical for it would mean that the apparatus, including the horn, would have to be placed in the projection booth, thus destroying much of the illusion. If the machine were assembled back-stage in the theatre, it would be next to impossible to have it run in synchronism with the projection machine. Magnet Regulates Sound Again electrical engineering has come to the rescue with a simple little device which is really a generator of minute electrical energy. An exceedingly small horseshoe magnet forms the basis of this device, and between the poles of the magnet a small coil of wire is so fixed that the needle in travelling over the bumps and hollows of the record will cause a slight movement of this wire coil. The result is a small electrical current which is in exact accord with the original sound reproduced and a great improvement over the older types of nonelectrical sound boxes. * Best of all, the output of this little magnetic unit may be fed into two wires which may be led anywhere to an amplifier and thence to the usual array of loud speakers. Thus the tone arm is done away with and the output of the record may be brought to. any point where a wire may be run. The device is as simple as it is effective and is being widely used on modern phonographs by leading manufacturers. This type of record runs in exact synchronization with the projection through a turntable which is geared to the same motor that runs the projector. The records are not of the standard variety, but are somewhat larger and are designed to revolve at a much lower speed than usual, thus making it possible for one record to last throughout the showing of a reel. The change from reel to reel and from record to record is accomplished through the use of two projectors and, of necessity, two turntables, with a device known as a “fader” which, as the first record nears its end, permits the first one to be faded out and the second to be faded in just as the change in film is made from one projector to the other. The music at the start of one record will overlap the music at the end of the other making it possible for an experienced operator to make the change from one record to the other without the audience being aware of it. This same fading idea has been in use for a long time in shifting from one film to the next so that there shall be no break in the continuity. Another method, and one that is closely allied to the one just outlined, is called the non-synchronous system in which the record is turned on an entirely separate turntable at speeds in accord with the requirements of the film. This is work for an expert operator, but the system has been in successful use for some time. This record is “cued” so that the operator can tell where it should be changed if necessary, and it has the added advantage that the operator does not necessarily have to be in the projection room, but can be anywhere in the theatre so long as he can see and hear what is going on. It is also unnecessary to have special low speed records for this work, and some of the phonograph companies are already turning out such recordings to go with certain pictures. The ordinary theatre orchestra may be played for a certain part of the film, but during the most exciting parts it may be desirable to have the voices of the actors heard instead of stopping for sub-titles. Through the non-synchronous system this is possible although it may be adapted to the other systems as well. 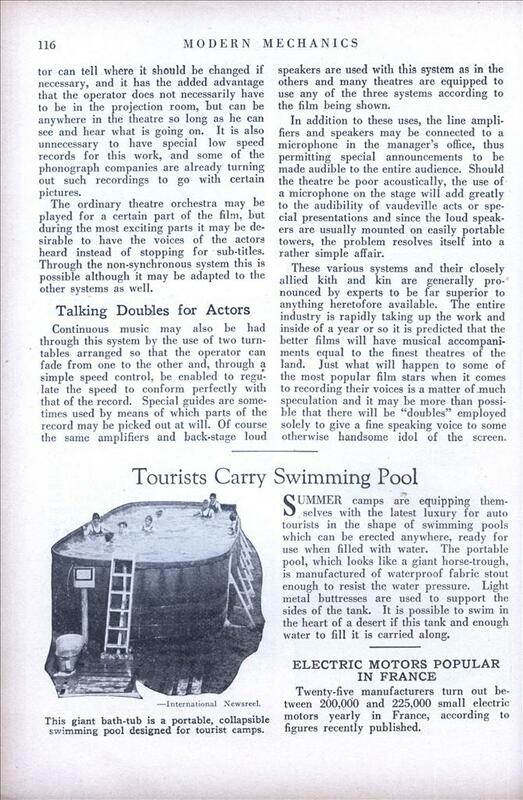 Talking Doubles for Actors Continuous music may also be had through this system by the use of two turntables arranged so that the operator can fade from one to the other and, through a simple speed control, be enabled to regulate the speed to conform perfectly with that of the record. Special guides are sometimes used by means of which parts of the record may be picked out at will. Of course the same amplifiers and back-stage loud speakers are used with this system as in the others and many theatres are equipped to use any of the three systems according to the film being shown. In addition to these uses, the line amplifiers and speakers may be connected to a microphone in the manager’s office, thus permitting special announcements to be made audible to the entire audience. Should the theatre be poor acoustically, the use of a microphone on the stage will add greatly to the audibility of vaudeville acts or special presentations and since the loud speakers are usually mounted on easily portable towers, the problem resolves itself into a rather simple affair. These various systems and their closely allied kith and kin are generally pronounced by experts to be far superior to anything heretofore available. The entire industry is rapidly taking up the work and inside of a year or so it is predicted that the better films will have musical accompaniments equal to the finest theatres of the land. Just what will happen to some of the most popular film stars when it comes to recording their voices is a matter of much speculation and it may be more than possible that there will be “doubles” employed solely to give a fine speaking voice to some otherwise handsome idol of the screen. Here’s a cartoon from that era that describes the Western Electric sound on film version. Select the stream or download most suitable for your circunstances. 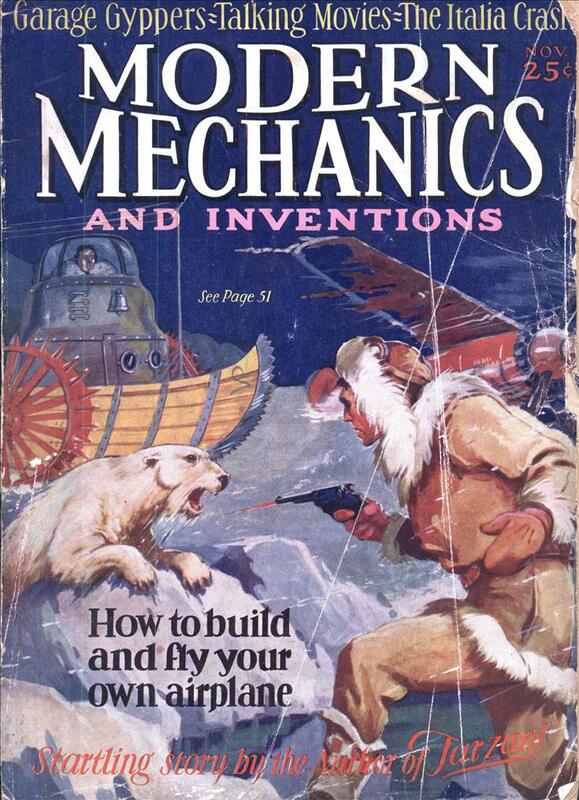 …it’s from 1929…. a Max Fleischer Cartoon!